Shelby is a strikingly beautiful 7½-year-old dark brindle female, born April 3, 1999, according to the SPCA records when she was originally impounded as a stray in April of 2006. Her tattoos are very difficult to read, as her ears are dark; however we are still trying. She has quite a story, and it just goes to show we should never think we've seen it all. Shelby was adopted within a week of her arrival at the SPCA. 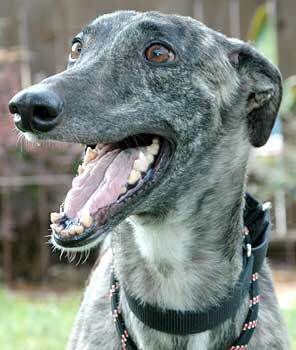 Within two months Shelby was found advertised on "Craig's List" under "spring cleaning," as "7 year old female greyhound - free to home." She is now in GALT's family, and it was a blessing as her Protatek tests show her positive to two tick-borne diseases. Her treatment for these has now been completed and was successful. 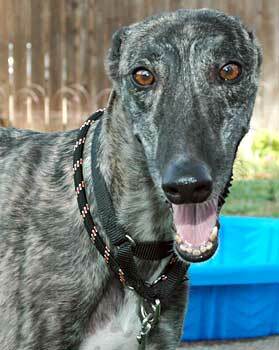 Shelby is quite a girl and will be a wonderful addition to a home; she is very communicative! Shelby is not cat tolerant, but she has not been tested with small dogs. You would never guess this girl is 7½ years old...and don't bother wasting her time by telling her. Shelby's attitude is "carpe diem." She lives life to the fullest. Her joie de vivre energizes the day. Life is one big, fun tail-gate party for this tail-wagging girl. Nothing can be gloomy or dull with Shelby in the house. She definitely has become the social director of our home. Shelby's motto is "whoever has the most toys wins" as she totes them around, relocating toys from place to place. She also LOVES a good 20-minute walk; however, she is also very happy with just romping in the yard. She greets her meals with much gusto and enthusiasm, as if they came straight from the renowned Cordon Bleu. Shelby gets along excellently with other canine residents, but also does well by herself as long as she can have some of your attention and loving too. 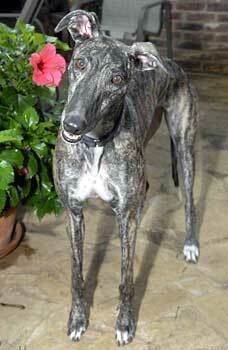 The perfect greyhound for the first-time greyhound adopter or as an addition to the growing greyhound household. All her exuberance prepares her for a good night's sleep. For Shelby, lights-out is early, and she sleeps through the night. In the morning, once she hears reveille, she's up and ready to pursue whatever the day has to offer in activity and entertainment. 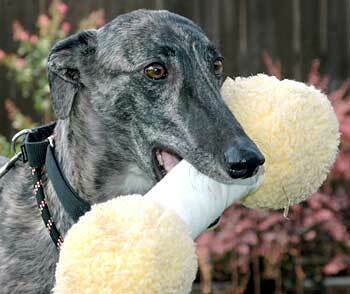 Okay, she throws in a few greyhound power naps too. Shelby is house trained, but has a mild case of counter-surfitis (sniffing along the table top during meals), which is successfully being discouraged with the use of a spray bottle with water. She currently is not being crated, but will stay in a gated room, although she prefers to be with the other dogs.